Enter to win a Sueno Organic Wool Comforter (a value up to $744!)! No purchase necessary to win. Giveaway ends December 24th, 2015. Colder months have arrived and there is nothing that compares to snuggling under the warmth of healthy organic covers as outside the wind howls and the temperature drops. 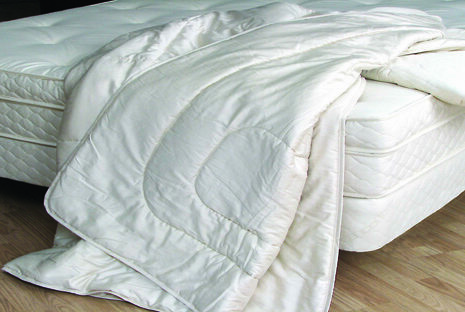 One of the best ways to keep warm is with the Sueno Organic Wool Filled comforter. There are so many reasons we love cuddling with a wool comforter! Wool is breathable, which makes it great for regulating body temperature and for controlling moisture. It’s also naturally dust-mite resistant which makes it ideal for those with allergy concerns. The Sueno Natural Wool Filled Comforter has the added bonus of being available in two different fills—Fall Weight which is great for colder climates, and Summer Weight for people who sleep a little warm or live in warmer climates. Personally, I love the smooth feel of the organic cotton that the organic wool is quilted to, and that it is a natural, undyed color. Made by Sleeptek of Canada. The Natural Sleep Store is excited to offer a Sueno Natural Wool Filled Comforter (choose your size) as our Holiday Giveaway! The contest ends on December 24th. Keep it, or give it away as a (really) nice gift! Dane B. of Kansas City, MO is the winner of this giveaway!